As of this day I still have not received a reply from my fax communication to the field's owners on July 9th. Without being able to personally interview them or sample their field, I am only left with the information contained in the Catherine Moy's article. It was obviously made clear through direct quotes from the owners of the field how they feared a potential public onslaught that would create a 'circus atmosphere'. They emphatically indicate the formation is human made, evidenced by '2 sets' of foot tracks and a 'dragging mark' they found clearly left in the field on their June 4th discovery of it. Also of important note made by the owners - that the 28 smaller circles were not there until several days later when they state the circle makers 'came back to finish their work'. It is interesting to note that Catherine had checked with the mother of one of the 'boys' from last year's hoaxing claim on R-1 [Rockville, Solano '03 circle], finding out they had no part in it. So up to this point no one has claimed responsibility, but then who would knowing how these farmers feel about it, and would certainly go full bore in pressing charges if found out? On the other side of the coin...it is entirely possible Mr. & Mrs. Owner__have taken this very strong stance of 'knowing this is a hoax' , entirely motivated out of their own personal sentiments and fears . This may be indicated through their immediate measures to eliminate the designs imprint on the ground, refusal to respond back to me even with an answer of 'no', etc.... So is it further possible then they may have confabulated the 'tracks' story to further underscore this hoax? Certainly these combined elements would eliminate any remaining public or research interest in the formation. This beautiful crop formation in Solano of June 17, 2004 is reminiscent of the previous year's formation only miles away in Rockville. While it lacks the majestic size of the earlier formation, the two show a very similarly notable distortion from perfect geometry. The '03 pattern shows a true North alignment that is bent towards the magnetic North pole at the southern end of the formation, in an array of circles that do not quite show a true symmetry. The bending in the long axis of the design occurs at the central cluster of three circles, which may symbolize a molecule of water: an oxygen atom linked with 2 hydrogen atoms. This new '04 circle can also be seen to represent molecular water, the 3 atoms in this diagram being shown as large circles with small circles showing their sharing of 8 electrons in covalent bonds. The geometric referencing of molecular water is a visual clue to the method of formation: microwave heating of water in plant stem nodes by plasma vortices, as described in the extensive work of Dr. Levengood and his associates. California's Solano (38.26°N 122.24°W) crop formation events have occurred 7,457 miles from the Orion pyramids of Giza, Egypt, a resonant distance that is exactly 30.0% of the Earth's mean circumference (of 24,892 miles). 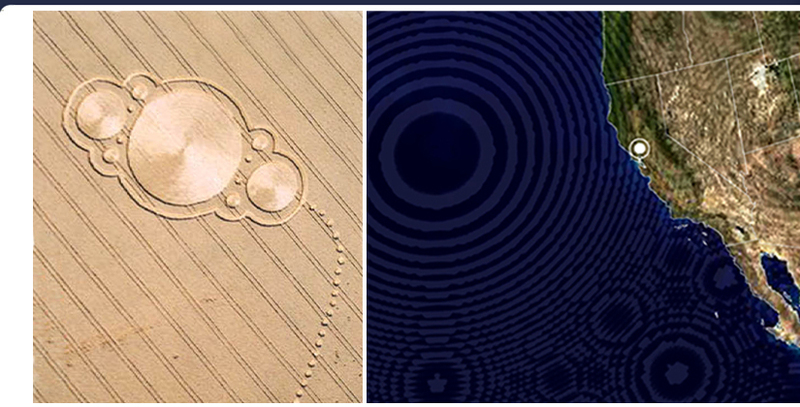 The resonance map above reveals the invisible nonlinear field of standing infrasound waves that is synchronous with the formation design - a precise mathematical structure within which the ethereal circlemakers are rendering their profound messages to humanity. 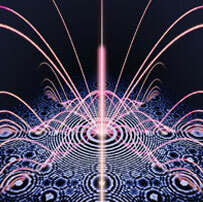 The sacred mandala pattern of consciousness is bleeding through into our reality during this transformative period leading up to the magnetic reversal of December 22, 2012.